Dreams are not those that we see in our sleep; they should be the ones that never let us sleep. The humble and ever so magnanimous Ex-President, Dr. A. P. J. Abdul Kalam; who doesn’t know the great scientist and the notable achievements he made in his entire career of science and politics. But believe me when I say this, boy, you are about to be surprised. I was instantly hooked, bowled over, and emotionally moved to read the journey of this extra-ordinary man. If you are an Indian, a proud-to-be-Indian person like me, one who loves his country and the amazing breath of fresh life we inhale amidst the dust of treachery and corruption, this book is for you. In fact, I’d go on to say, it is a must read for every Indian, every human being, every man aiming for the skies. I will not boast more about the book, and get straight to the main review. Dr. A. P. J. Abdul Kalam is an excellent writer, as good as a scientist he has been, a respected teacher, or a loved figure he is. His words touch your heart and surprise you with his tender language, and the soft literature he uses and suddenly you’ll find yourself standing in his garden, staring at the huge Arjuna tree, looking for bird nests and beehives. I have always seen people questioning the existence of God. But more than anything, I have seen men of science believing, with utter faith, in Him, the Almighty, never with a shadow of a doubt. Honorable Dr. Kalam is no different; a man of science, a man of faith, a man of God. He has woven all cultures in this little book and created pure magic out of it. I was surprised to see a man from a muslim community who doesn’t falter to express the verses of Gita or Bible. Dr. Kalam entrancingly draws out his experiences as a child, teenager and an adult. In the twelve superbly written chapters, he shares with the world, how he dealt with various dejections in his life, failures and death, and how he transformed something so dark and disheartening into pure light of creativity. The chapters, ‘My Father’s Morning Walk’, ‘Three Great Hearts Resolve a Problem’, & ‘A Brush with Fire’ are stirring and make you ponder on life, success, failures and more importantly, the role of a mastermind behind us all. His poems are profound and expressive and they reflect his innermost thoughts in just few verses. The last poem, from the chapter a life in science, addressed to the youth is especially pensive, depicting how deeply he thinks. The subtle yet grave illustrations by Priya Sebastian add an additional impact, forcing you to travel back to the times with Dr. Kalam and see him come alive in front of you. 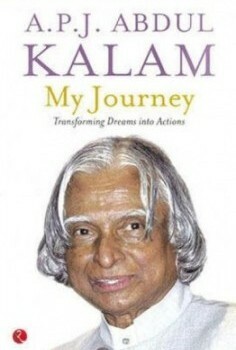 This entry was posted in Books, Online Reads, Reviews and tagged Book Review, Dr A. P. J. Abdul Kalam, Dr. Kalam, My Journey, Review. Bookmark the permalink. Overall the anecdotes of the book is pretty awesome and you would definitely want to read the rest of the series to know more about this great man’s journey of life. I agree Santhosh. The words, the experience and the journey, is something every Indian should read.